Bourg-en-Bresse is a commune in the Ain department. It is found in the Auvergne-Rhône-Alpes region in the east of France. It is the prefecture of the department and the capital of the arrondissement of Bourg-en-Bresse. The commune has an area of 23.86 km2 (9.21 sq mi) and its average altitude is 247 m (810 ft); at the city hall, the altitude is 230 m (750 ft). The inhabitants of Bourg-en-Bress are known, in French, as Burgiens (women: Burgiennes'). 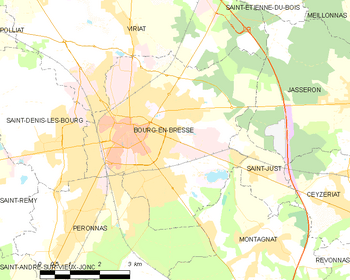 Bourg-en-Bress has a population, in 2013, of 40,490 and its population density is of 1,697.0 inhabitants/km2. Bourg-en-Bresse Facts for Kids. Kiddle Encyclopedia.